Our handsome new biology lecturer was annoyed. So was I. He was annoyed because every few seconds another latecomer would bang noisily into the lecture theatre and interrupt his speech on physiology. I was annoyed because I was premenstrual. I don’t know why I said that. I didn’t know where any of the students were coming from. “Is that your case?” asked the handsome lecturer. “No,” I admitted. I come from three miles away and always arrive early for my lectures. I didn’t let that fact dissuade me from continuing to speak for my fellow students, most of whom I wouldn’t recognise if I saw them in the street. In fact, our previous lecturer always arrived late and dishevelled, with no plan of what he was going to say to us, and only got away with it because he is blessed with the gift of the gab. The following day, on my way into the Biosciences building, a duck sprang out of the shrubbery and almost collided with my head. 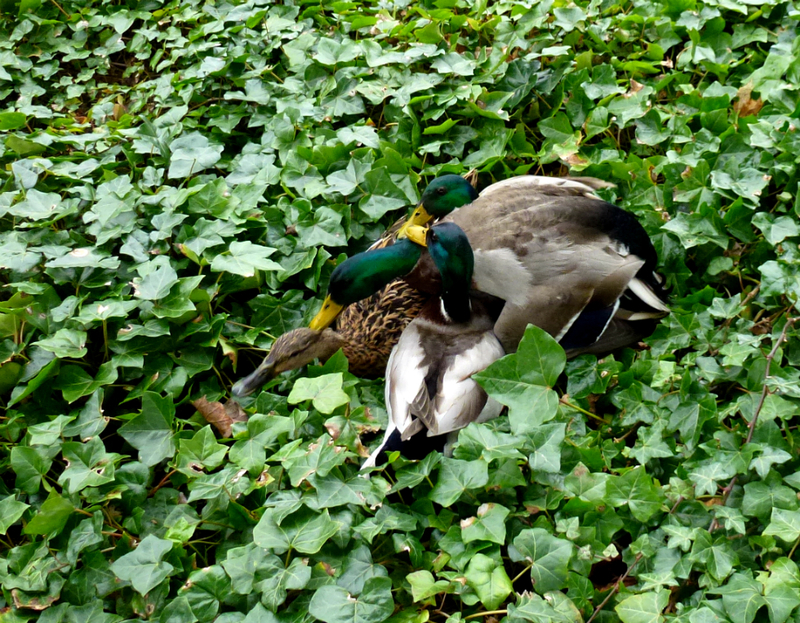 Turning in surprise, I saw four more angry mallards wrestling among the foliage. It appears that I am not the only one being swayed by hormones lately. The males, with their sunshine-yellow beaks, were pecking and shoving each other out of the way in a scramble to be the first to mate with the brown female trapped beneath them. 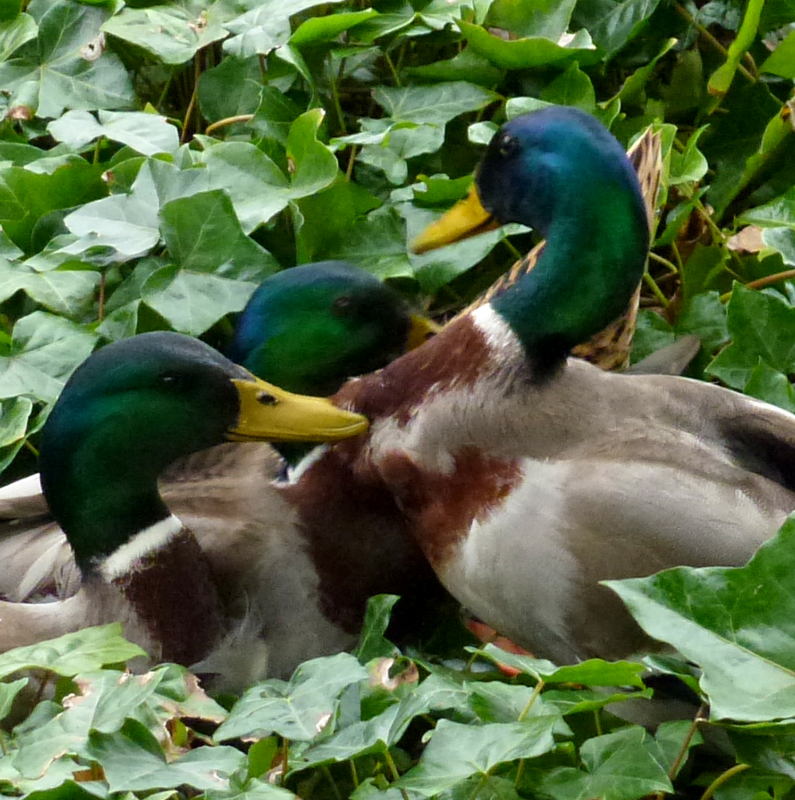 Despite their fancy plumage, drakes are not the greatest proponents of courtship. They were so intent on their struggle that they completely ignored me when I walked up to them. I contemplated rescuing the female, but decided this would only prolong the inevitable for her: the drakes would chase her until she sank down exhausted in some other patch of greenery, or worse, in the water, where the pressure of their bodies might drown her. Here, she looked unhappy but not in physical danger. 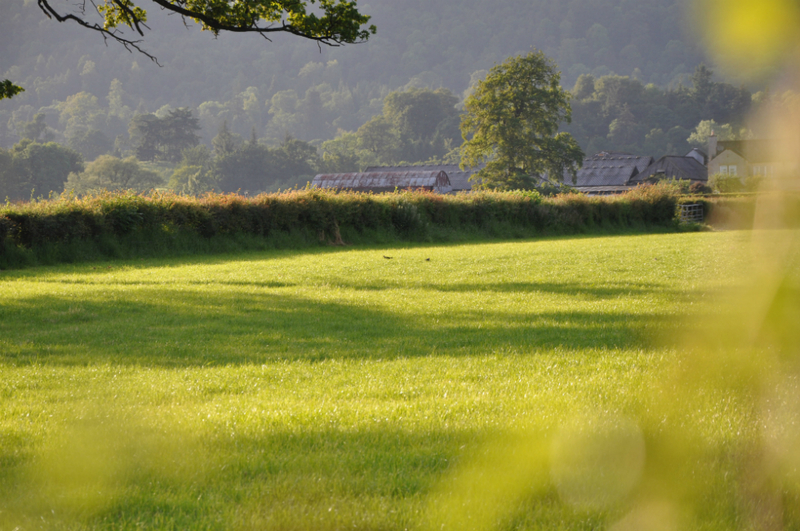 So instead, I observed and took some photos. This caused me to lose track of time, and I arrived late for my lecture. I saw with some horror that the lecturer was standing at the back of the theatre, apparently waiting for me. He delivered the lecture several minutes late, and finished with minutes to spare. There were no interruptions. In the UK, if your first words on the first day of a month are “rabbit, rabbit, rabbit”, you will have good luck for the rest of the month. The first day of March is especially rabbity for me, because it is Harvey the Rabbit’s birthday. That is to say, when we adopted his playful self from the unwanted pets place, nobody could tell us his real birthday, and so I chose today to be it. 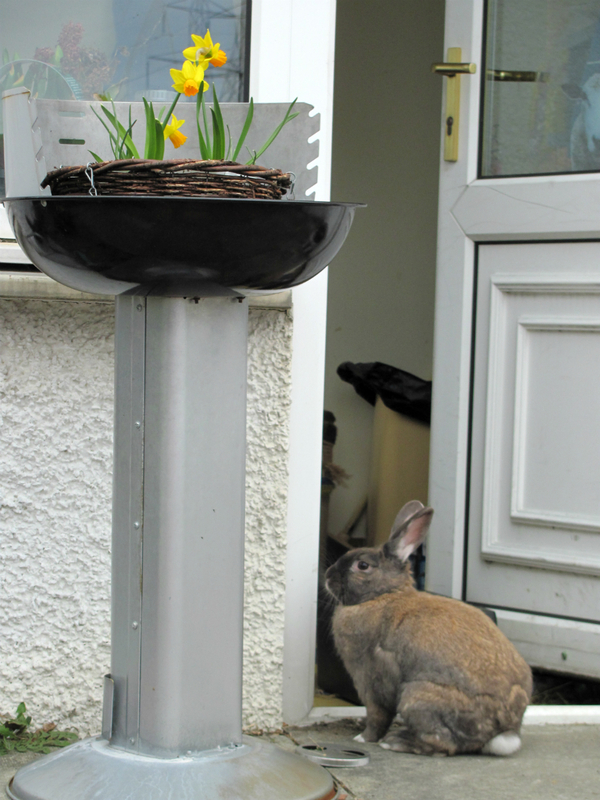 I picked Saint David’s Day for him because he liked Daffodils. Saint David is the patron saint of Wales, where I was born, and it is celebrated by the wearing of a daffodil on one’s lapel. Now daffodils are pushing up through the soil on Harvey’s grave, and I am spending today thinking about his enormous personality. A friend once called him a “bounder”, and that’s exactly what he was: the most opinionated pet I ever had. One day he threw a tantrum because I had put his litter tray back the wrong way round. He liked to chase balls, and he loved to chase cats. He slept with me on the bed at night, until one night he took umbrage at the fact that Bunty was taking up too much room, and so peed on his head. He took great delight in climbing impossible things, and bouncing on the inflatable airbed. 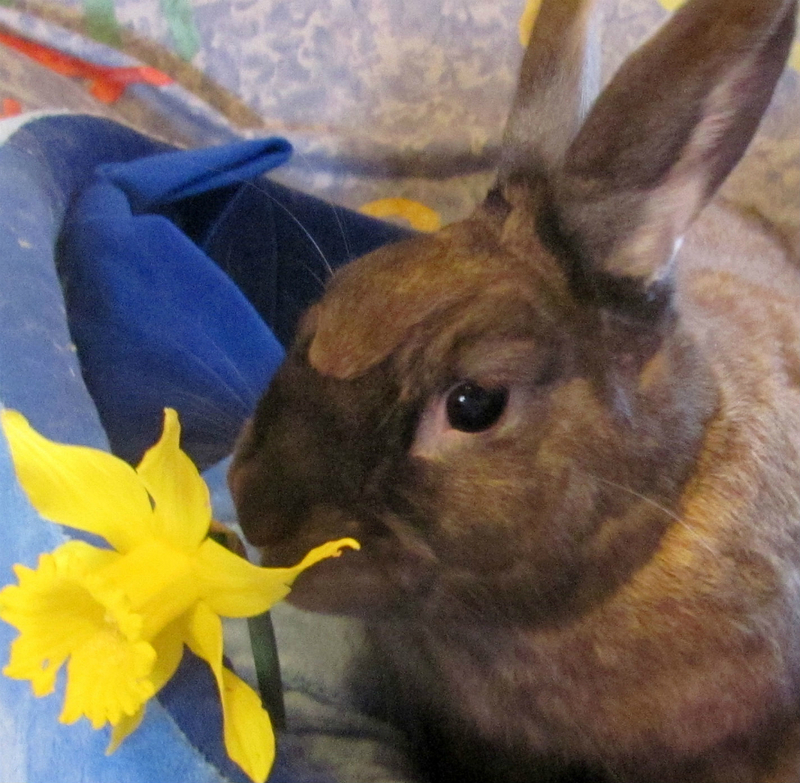 He ate daffodils. This whole blog is dedicated to Harvey. I began it a few weeks after he was run over on the road outside our cottage. It was a way to remind myself of the many great things in my life, and of how breathtaking is the place where I have made my home. I no longer need reminding of these things, but thanks to my love for Harvey, I have come to enjoy this excuse to look around at my world and feel awed.